to work with Ghanaians Ghanaians in Canada, especially in Toronto, have been given the golden opportunity to “work” with the office of the Minister for Immigration and Citizenship, Hon. Judy Sgro, to resolve some of the bottlenecks which Ghanaians in particular and refugees/immigrants to Canada in general face. Hon. Minister Judy Sgro invited 3 to 4 volunteers from the Ghanaian community in Toronto to join a small committee at her office to work on finding solutions to the numerous cultural and political challenges facing her ministry. 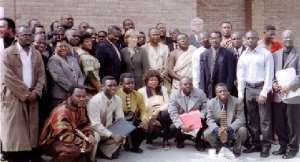 This invitation was made in Toronto on Sunday, March 28, 2004 during a healthy and frank interactive meeting between the Minister and a well-represented high profile cross-section of the Ghanaian community in the Greater Toronto Area. Issues discussed at this well-attended and profitable meeting included the hiring of Ghanaian Canadians at Canadian visa offices which handle applications from mostly Ghanaians; the extension of temporary visas to seasonal workers (farmers from Ghana) as done to Mexicans and the Caribbeans; selective deportation and racial profiling; Canadian experience for independent skilled workers; DNA burden put on sponsors and their relatives being sponsored to Canada; deprivation suffered by low income sponsors under the system; and the undue subjection of relatives who are not accompanying applicants/sponsors to medical examinations and long security checks. Others touched on the abuse of discretional powers by some immigration officers; the integration of Ghanaian youth sponsored into Canada into the Canadian education system; the “uncompassionate” rejection of applications by refugees on humanitarian basis; and the unnecessary request of proof of assets by the Accra visa office on aging parents of sponsors. Ably supported by the Director of Immigration in Toronto, Mr. Jimmy Campbell, Hon Judy Sgro reasoned with the Ghanaian community on how best her ministry could address the issues raised in the most acceptable manner so that “while we make progress we also preserve the integrity of the system”. She agreed with the participants that there are unnecessary bottlenecks in application for visas and sponsorship due to cultural misunderstandings between her ministry and the Ghanaian public. “However, there are some who try to abuse the system”, she said, “but the integrity of the system must be protected as we find ways of removing the obstacles that frustrate the efficiency of the system”. Hon Judy Sgro who assumed the office of Minister of Immigration and Citizenship only three months ago admitted to the Herculean task that faces her ministry when it comes to dealing with people of cultures different from that of the western world. She hinted that the government of Canada is trying to hire more visible minorities to work in Canadian Visa offices across the world. The Hon. Minister, however, pleaded for patience since the process is very slow. She praised the organizer of the meeting, Mr. Evans Akuamoah Boateng (alias Okyeame Dogo) who is Ghanaian social activist in Toronto and, the Ghanaian community for the opportunity granted her to interact with them on such important issues affecting her ministry. She called for improved and constant communication between her and the community and promised to raise the concerns by the Ghanaian community with the federal government in Ottawa. Hon. Judy Sgro lamented on the recent deportation of Benjamin Osei, a Ghanaian youth worker in Toronto back to Ghana. She disclosed that she is personally monitoring the sponsorship of Benjamin Osei back to Canada. And that she will be physically present at the airport to welcome Benjamin Osei back to Canada the day he sets foot on the soil of Canada soon. Hon. Judy Sgro who is also the M.P. for York West has been having very good relations and rapport with the Ghanaian community in Canada. She attends functions organized in/by our community such as the Ghanaian Canadian Achievement Awards and has been very helpful in the development of the Ghana Amansie-Canadian Multicultural Association of Toronto Housing Project in Toronto. The Consul General of Ghana in Toronto, Nana Boahen took time to thank the Minister and her entourage (office) for such a wonderful period of interaction. The moderator of the occasion was Prof. George Sefa Dei of the University of Toronto. Those present at the function from the Ghanaian community included educationists, lawyers, doctors, leaders of Churches/cultural and ethnic associations and immigration consultants such as Auntie Sophie.